Anyone who has opened a box of crackers to find the contents reduced to broken bits and pieces knows firsthand the consequences of poor packaging. Carman’s, an Australian food company passionate about only using the best ingredients, is mindful of how it delivers its products to consumers to ensure a high quality experience before the first bite is ever taken. 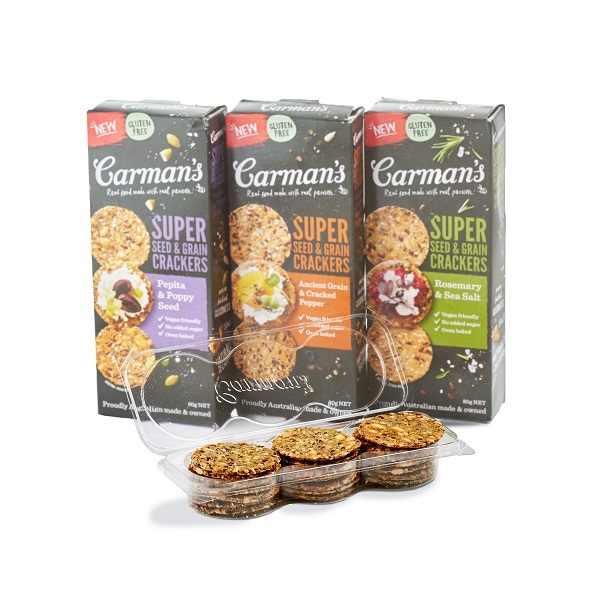 Therefore, when Carman’s launched its new Super Seed & Grain Crackers, the food company kept presentation and preservation top of mind, and enlisted Birdstone, an Australian packaging design agency, to design an engaging tray insert. Due to the various requirements they needed to balance, multiple prototypes were required to demonstrate the proposed designs both aesthetically and functionally. Read the full case study here to find our more. Visit our new 3D Printing Portal or contact us directly to find out how.